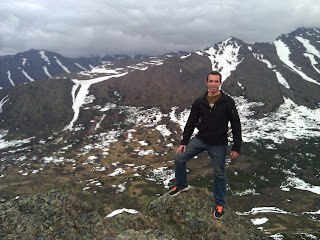 I've attached a photo of Keith in Flat Top, Alaska. He's eaten a Moose salad and had Caribou sausage and eggs for breakfast! He told us He's doing well and the Lord is using his group to be a blessing to many churches in Alaska. Tomorrow is Father's Day! I trust you will be able to join us for Sunday services. Many of our members will be out of town so we need everyone that is still here to be present! I'd much rather preach to people than pews! Please be in prayer for Dustin Woosley. Rachelle informed us that he was involved in some sort of vehicle accident yesterday in Afghanistan. He is doing ok but two of the other passengers are in pretty serious condition. May God bless you. I'm praying for you.